WWW.POTATOGROWER.COM 23 Bauer • (800) 922-8375 • www.bauer-at.com 2Fuel Technologies • (210) 846-6182 • www.2fueltechnologies.com Tuctronics • (509) 301-0640 • www.tuctronics.com • todd@tuctronics.com AgriNET Tuctronics is a family partnership that has been engineering telemetry products for control and monitoring in agriculture for over 20 years. Tuctronics' AgriNET is a cross-platform app that allows the user to access the data solutions from the company's hardware and any third-party hardware. The idea is to bring all the technology a grower needs to make decisions into one app. The primary goal of Tuctronics' soil moisture monitoring solution is to provide an accurate, quick method to view many probes at once to determine whether any sites need a closer look or irrigation adjustment. Tuctronics takes the time to train new customers on graph interpretation and will recommend budget line levels until they feel comfortable enough to set their own. Tuctronics/AgriNET can fully support the products even if they don't have boots on the ground in a particular area. The company quickly responds to troubleshooting and will ship parts with instructions and phone support as soon as needed. 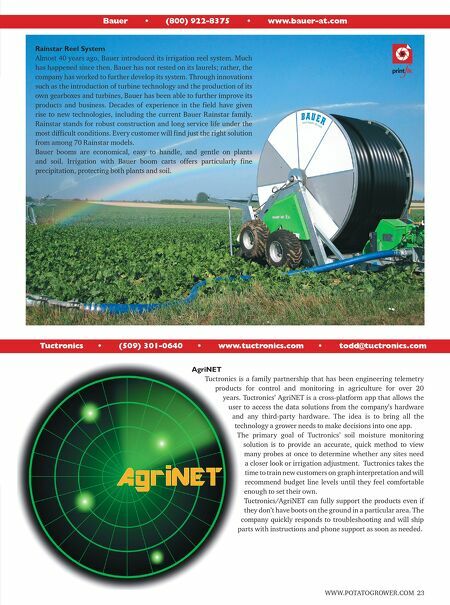 Rainstar Reel System Almost 40 years ago, Bauer introduced its irrigation reel system. Much has happened since then. Bauer has not rested on its laurels; rather, the company has worked to further develop its system. Through innovations such as the introduction of turbine technology and the production of its own gearboxes and turbines, Bauer has been able to further improve its products and business. Decades of experience in the field have given rise to new technologies, including the current Bauer Rainstar family. Rainstar stands for robust construction and long service life under the most difficult conditions. Every customer will find just the right solution from among 70 Rainstar models. Bauer booms are economical, easy to handle, and gentle on plants and soil. 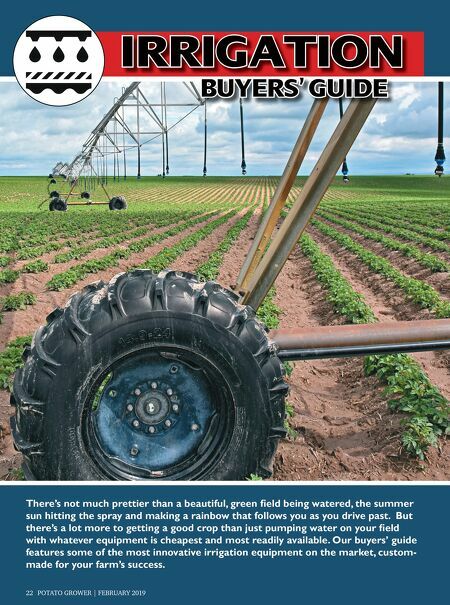 Irrigation with Bauer boom carts offers particularly fine precipitation, protecting both plants and soil.